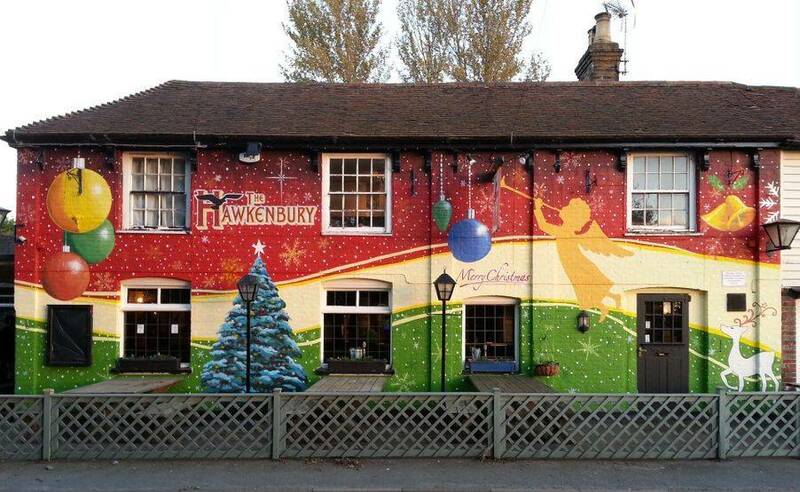 This is a sleepy little village pub in the heart of Kent that we paint every November with a Christmas themed mural that covers the whole building. 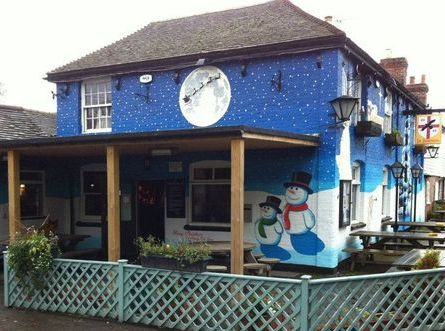 In January it is repainted with a plain colour and the next Christmas we paint a new design. Originally this was just to promote their Christmas dinners but it turned the establishment into a real attraction. 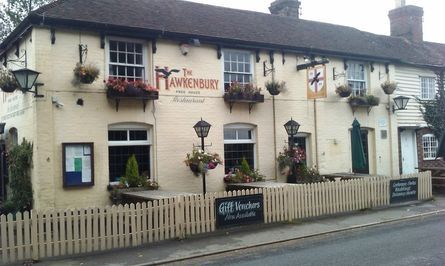 Word got round and the Hawkenbury Inn became the talk of the town, making not only the local papers but also the evening news on TV! 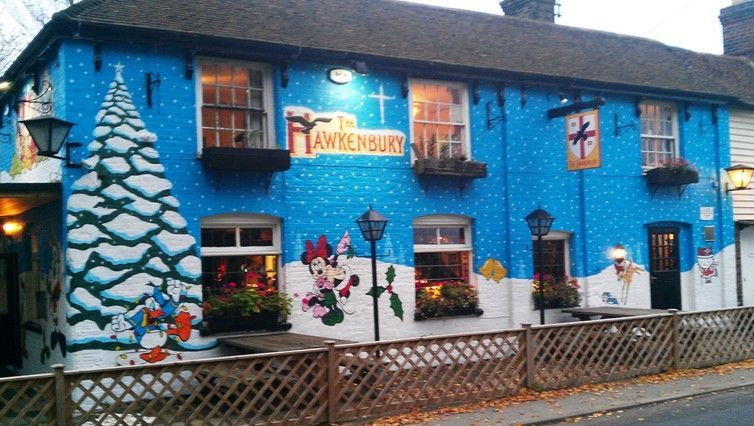 The Hawkenbury had their busiest Christmas for years and now it is a place that people come from miles around to see! 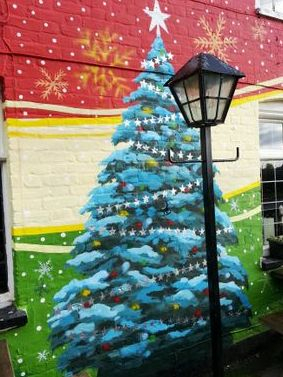 We had lots of ideas on what to paint the first year but I wanted the front to look like a christmas card with this eye-catching wintery scene. 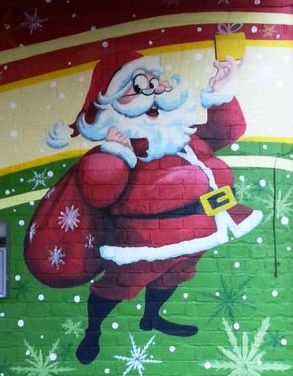 The entrance wall had a 7ft tall santa beside the name with the background purely decorative. In the corner was a christmas tree and roaring fireplace to keep the smokers warm. 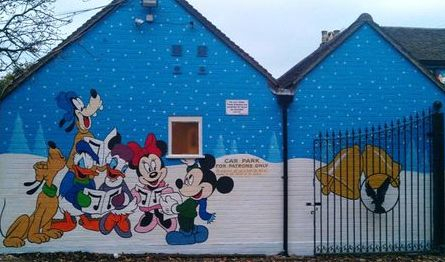 In 2010 we went with a complete colour change to the year before and we also painted the wall leading to the car-park. This sunset red gave the building more uniformity than the first year and the front had a traditional nativity scene in silhouette. 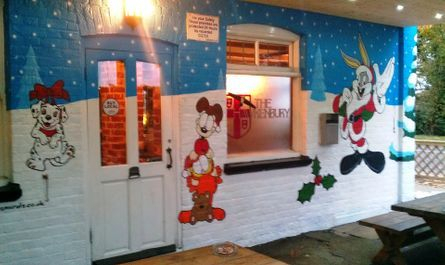 The entrance wall had a large snowman painted on it and the car-park wall had a big, happy Father Christmas. 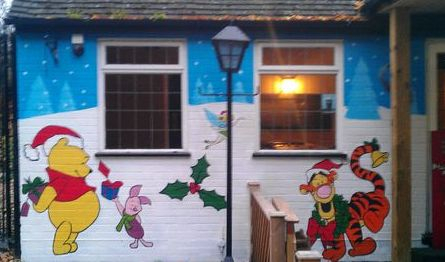 For 2011 the landlord wanted the design to appeal to the children (it is a family pub) and include many popular cartoon characters. We returned to the blue of the first year and the landlady loved the big christmas tree on the corner so she asked us to repeat that again as well. 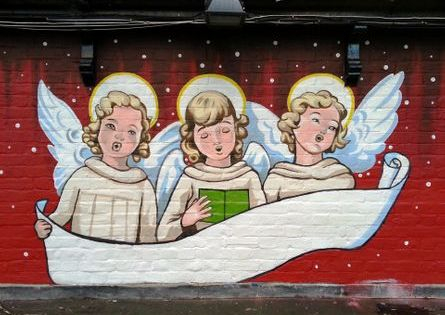 The theme for this years mural was snow-men and angels. The front of the building features a little angel looking up at a big angel and a huge christmas tree with lights. 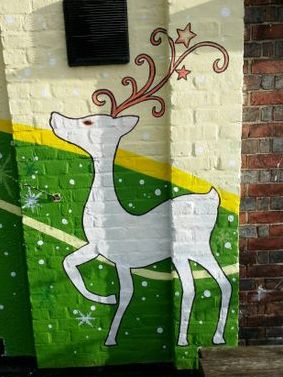 The main enterance walls have snow-men, reindeer, christmas bells and holly painted on them. Above the smoking shelter you can see a large moon with a silhouette of santa's sleigh going across it. We painted this right under the spotlight so that at night it realls shines and, from a distance, looks like the real moon low on the horizon! 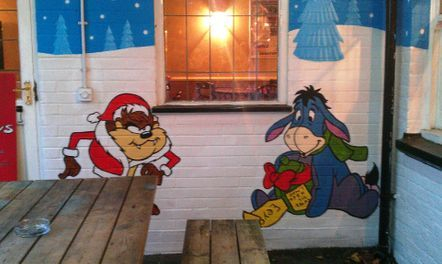 The car-park wall was painted with Three Wise Men on camels and a simple 'Merry Christmas'. This is the 5th year we have painted this and we decided to go with traditional christmas colours of red, gold and green in a big ribbon around the building. 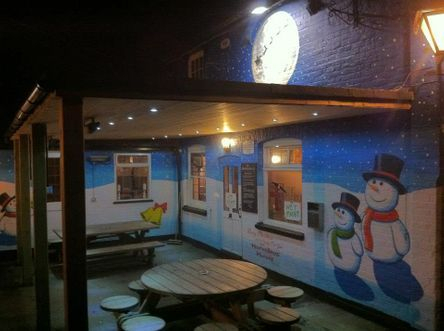 It is decorated with snowflakes and christmas baubles. On the side the theme continues with angels and Father Christmas. 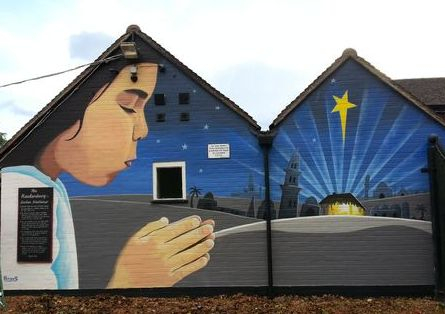 On the wall facing the carpark we painted a nativity scene with a young girl in the foreground praying. Here's a little time-lapse film of us painting the 2013 Christmas mural. Each year it takes us between 7 and 10 days to hand-paint this building and then about 3 days to paint over after christmas. They are an excellent way to promote your business and are planned according to your budget with all the design work created ourselves. These are painted in exactly the same way as the rest of our murals and, if they are not painted over, they can last for 20+years! We can even protect them with anti-graffiti varnish for easy cleaning!